SALT LAKE CITY While many people wave goodbye to summer and all the fun activities that fade away with the season, savvy adventurers and seasoned guides know that fall is the best time to enjoy whitewater rafting and mountain biking in Utah’s canyons and desert highlands. Holiday River & Bike Expeditions, a family-run company that has offered quality outdoor experiences for 30 years, offers several fall trips to shake the summertime blues on the rivers and mountain biking trails of southern and eastern Utah. Optimal conditions — warm days, cool nights, temperate water and no river traffic — make September one of the best times to enjoy all that the area has to offer. 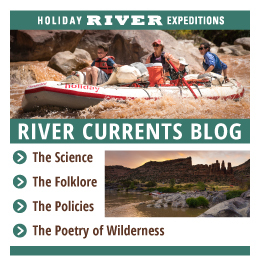 Holiday’s September line-up of river trips includes six-day trips on the roiling Colorado River through Cataract Canyon or eight-day trips through the Lower Grand Canyon. If a weekend get-away is more in order, shorter Westwater or Lodore Canyon trips leave guests with memorable vistas and river thrills. For the avid adventure seekers, combination mountain biking and rafting trips take guests pedaling along the quintessential White Rim Trail for three days, ending on a white sandy beach of the Colorado, where a raft awaits for four days of rapid running fun. Or, for gearheads and landlubbers, Holiday’s four-day mountain biking expeditions along the White Rim Trail run through October. For a schedule or more information about Holiday River & Bike Expeditions fall trips, please call 1-800-624-6323 or 801-266-2087.